A fascinating article from Raechel Towne for our friends at Light Stalking, including some interesting and iconic photographs. Photojournalists are an under-appreciated lot that have done important work in maintaining an informed populace in our society – an inherently important part of a functioning democracy. It is always a hugely popular topic among all photographers when we cover it here, so we decided to put together a brief history of this ver rich subject. Photojournalism differs from other types of commercial photography which involve people in that the subject has no say in how the photos are used or constructed. Like in traditional print journalism, the photojournalist’s job is to document a real story in the most authentic manner possible and with the utmost journalistic integrity. Follow the link to read all of this article A Brief History of Photojounalism. For more great iconic pictures you can pre-order this new book from Time Magazine. After all, we live in a visual age, when history is both made and experienced through photographs, from the flag raising at Iwo Jima to the thrill of the first footstep on the moon. 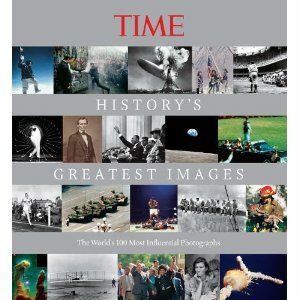 Now "TIME" has gathered the most significant and influential photos in history in a magnificent volume that celebrates the art and craft of photojournalism: Great Images. Here are scientific breakthroughs, political upheavals and social revolutions, from the first photographs of an embryo in a human womb to the indelible images of America's Civil Rights movement. Here are sailors kissing nurses, a single man defying a Chinese tank, fire-fighters raising the American flag over the ruins of the World Trade Centre. Based on a highly successful 2000 book, this new edition has been completely updated to add the most significant pictures of the last decade, from hanging chads ands the wars in Afghanistan and Iraq to Hurricane Katrina and the 2010 earthquake in Haiti.